Women leaders are leading the Balkans through tough times that call for even-minded diplomacy and compromise, crucial leadership qualities that many of the "warrior leaders"/male nationalists who ruled during the war-torn '90s weren't able to provide. "Women have always been more successful than men, with all due respect," Duska Latinovic, a nurse from the Serb-controlled part of Bosnia, told the AP. "Women are ... more sensitive, stronger, emotional, and in these rough times people need more of a heart." One new political star is 43-year-old financial expert Alenka Bratusek (pictured above), Slovenia's first female prime minister. Constituents hope she'll fix the economy and restore confidence in crumbling state institutions. "It is important that this happened at a sensitive moment, a period of crisis," sociologist Milica Gaber Antic said. "It's a strong message to other women: 'We women can do it!'" 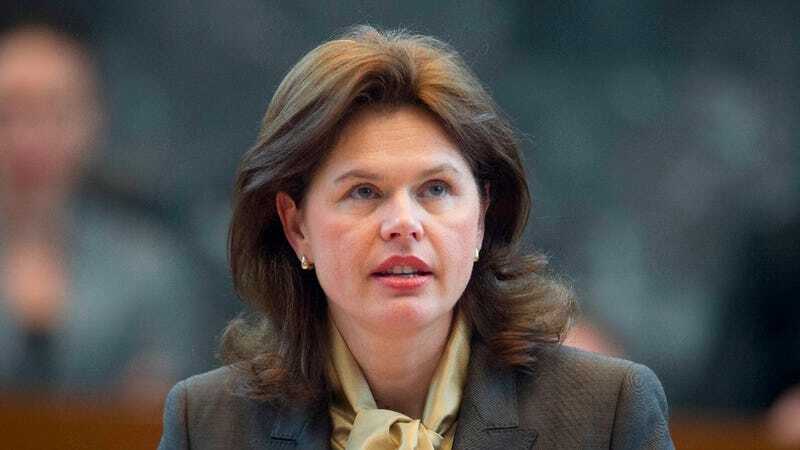 Last week, a little-known female politician, Zeljka Cvijanovic, was proposed as the new head of Bosnia's Serb-run mini state. No ministry in the central government is currently headed by a woman; she would be the first to lead it. "As a woman, I hope to add a new flair and a new dimension to the institutions of Republika Srpska," she said. Of course, sexism is still pervasive in the Balkans, lest you start to believe the area is a magical planet unaffected by global misogyny. Kosovo's Minister for European Integration Vlora Citaku said that "it is almost impossible to forget even for a moment that I am a woman - I've been reminded of that every day since I became a minister." "First of all they ask you are you married? What your dad think of you traveling alone surrounded by all men?," she said. "I mean, it's all these stereotypes ... There are certain duties that a woman must do in order to be 'complete.'" Bratusek responded that she wished "we women were no longer judged only by the length of our skirts." In Kosovo, Parliament members were recently given notebooks with an assortment of sayings including "silence is the only treasure a woman possesses." Sparkly Hello Kitty binders would've been less offensive. But Atifete Jahjaga, the female president of Kosovo since 2011, has more important issues to deal with than school supplies. "The power of women in the politics is a soft power," she said. "It is a positive change that our country and other countries in the region ... are making by giving a chance to women."